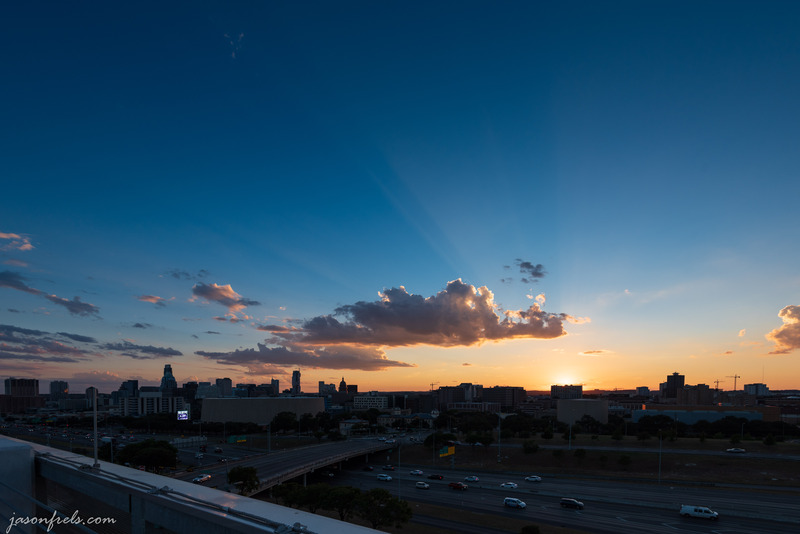 As mentioned in this post, I set up in a parking garage to photograph a sunset over downtown Austin. There were a lot of clouds in the sky and I had high hopes of a nice sunset show over the city. So, I patiently waited for the sun to sink. I took this photo as the sun was just sinking behind a building. I was hoping for a twinkle of lens flare from the last of the light. I didn’t get much of that but I got some nice rays of light across the clouds with a silhouette of downtown to the left. Perhaps as we get closer to December the sun will move farther South and the photo opportunities may improve. 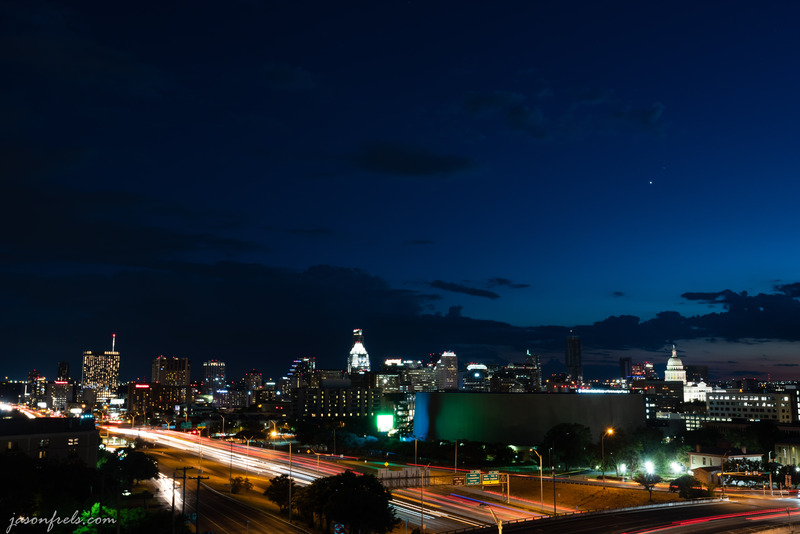 I don’t like the wall of the parking garage and the lightning rod in the lower left, but my tripod was about as high as it would go and I was at a very wide focal length. When I processed the above photo in Lightroom I corrected for the distorted skyline a bit. At 16mm focal length and with the horizon not centered, many of the buildings were distorted such that they appeared to be leaning toward the center of the photo. This was especially noticeable at the edges of the photo. By correcting for this in Lightroom, I did end up cropping a bit from the bottom half of the image. So, leaving some crop room in the frame is something to consider for future photos like this. The sun then set and the low clouds faded to gray and there was no post-sunset light show for me. As sunset turned to blue hour, I decided to take some long exposures. There were a lot of clouds moving across the sky and the car lights of IH-35 in front of me, so I thought I might get some interesting photos. The below photo is a 270 second exposure, or about 4 and half minutes. You can see a couple of stars stretching to the West and some blur from the cloud motion. The highway and the city streets are a nice blur of white and red lights from the cars. I knew that this photo was going to take about 10 minutes to pull off and I would get one chance to do it before the light went away. I first framed and focused the photo without a filter on the lens. I had to set the aperture to the fastest (f/4) and bump the ISO up to 400 to keep the exposure a manageable length. I calculated that I would need about 4 minutes to get a good exposure with the 10-stop filter. I then set the shutter speed to ‘bulb’, put the filter on the lens, opened up the stopwatch app on my phone, and started the exposure using a remote release. I decided to let it go for a full 4 and a half minutes as I knew that it would be getting darker during the time that the shutter was open. I also had to wait another 4 and a half minutes for the noise reduction exposure. It was a bit windy during this photo and I was a bit concerned that this would result in blur in the buildings caused by camera shake. If you zoom all the way in, you might see a small bit of blur. You will also see some noise caused by hot pixels in the sensor if you look closely; this would be a lot worse if I hadn’t used long exposure noise reduction. The image was taken at ISO400, but I suspect that it would still show up at ISO100 with such a long exposure and such a dark subject. But, you won’t really notice this unless you go looking. With the light nearly gone for the day, I took a few more quick photos of the skyline and called it a day. I kind of like the way the clouds frame the city in the following photo and there is still a hint of warm color on the horizon. When the tall building that is under construction finally gets lit up, I may have to take this photo again. 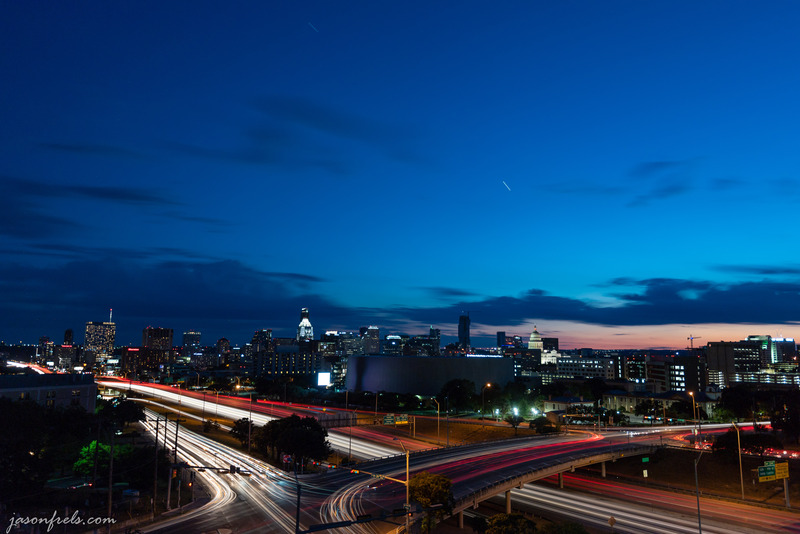 That’s downtown Austin Texas for September 1, 2018. The next day it got cloudy and has been raining on and off since. I may have to start scouting around for a new vantage point for downtown. This one is OK, but I mainly chose it for long exposure light trails on the highway in the foreground and I don’t think that the large arena across the road is very interesting at night.